Why is it that as a parent I make sure my kids go to the dentist religiously twice a year plus any other follow-up appointments they may need, but I haven't been to the dentist since.... hmm.... When was the last time I went to the dentist??? Ok, I'm not quite being the "model diabetic" here, am I? I want to set a good example for my children, but sometimes life gets in the way. It's sometimes hard for me to take time and money away from the family to do something for myself. At one point my hair was half way down my back because I had a hard time justifying the cost of getting a haircut. The dentist has become a somewhat easy to ignore "luxury" up until recently. At the end of June, I started getting a toothache that caused me to purchase a topical pain reliever. But early July, I lost a filling and another tooth was also hurting. Thankfully (?) these two teeth are on the same side of my mouth, so if I'm careful and eat on the opposite side I am fairly pain-free. Unfortunately, last week a piece of breading from my lunch snuck over to the other side and jabbed right inside the hole in my tooth! OUCH! Right after lunch, I was calling around to find a dentist. My previous dentist, who I really liked though some of his office staff were tolerable, has moved out of the area. I am now going to try out a new dentist. I have met him before, when my oldest was young. At the time, I liked the dentist and his staff but the atmosphere (general dentist) just didn't mesh with my child. Shortly after our attempted visit, we found a dentist that caters to the younger crowd (kids only) that my children enjoy. I'm nervous about going to the dentist. I've always had some anxiety. While typing this, I have probably misspelled dentist about 75% of the time. Does that say anything? Today's appointment is more of a consultation. I'm assuming I'll have some xrays taken and a treatment plan discussed. I'm hoping this is the first step of reinforcing to myself that I'm not being selfish by taking care of myself. Remember the talk before take-off on an airplane? 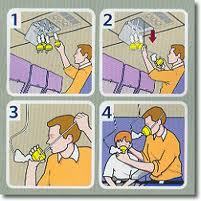 Parents, please put on your oxygen mask before putting one on your child. I need to remind myself that I can't take care of my family if I don't take care of myself first. good girl! I hope it wasn't as nerve-racking as you expected it to be! O knew you can do it. You are brave enough.